Some Aerosol Graffiti Artists’ manifest “imposseeblu” objects, sombunall based on alphabetical forms. Some BURST others bust! Graffiti Artist.n.t – blowing up – Alphabits with wind and semantext & putting word and world back together, back on the wall humpty fell from. Repairing the great language crash of 2009. Some Impossible lettengineers pay structural tribute to M.C Esher. Some experimental ASTRACTIVISTS use& Gurilla attack systems of Graffiti application, and deployment, adding to the information quotent within the surprise = information equation. span style=”font-size:130%;”> CHU‘s latest TRILOGY are a self-described “tribute to M.C ESCHER and GRAFFITI ARTISTS worldwide.” Parts 1 & 2 have been deployed already – we await the 3’rd. Waterfalls? 3 cubes? Mobius Strip II? Bebop turned Broadway upside down. Graffiti Art and has turned the modern ART Gallery INSIDE OUT. The streets have become galleries, again. With hidden treasure and tales for attentive observers. Publik Big Brother public amuses himself, themself and itself. Most Graffiti Artists have an inbred rejection of faux icons and defend the word-world by perpetually turning things inside out. Outside in. 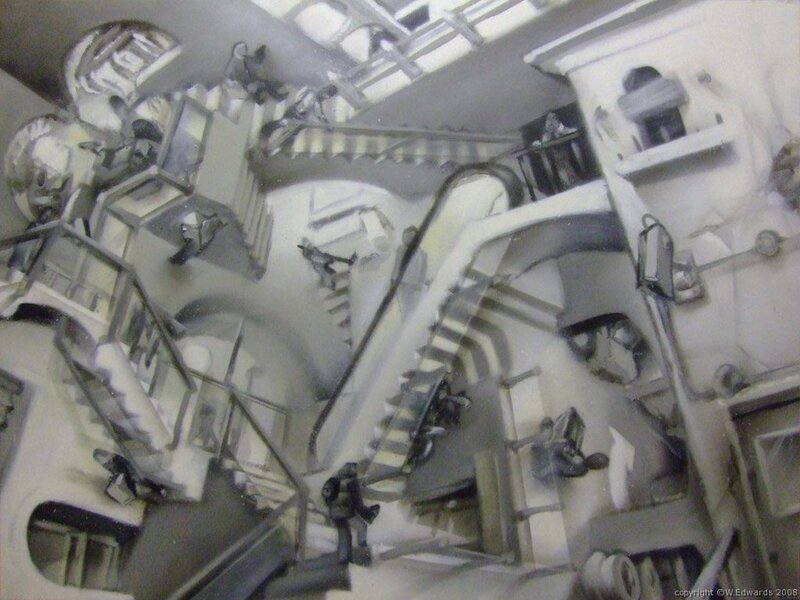 Like the experience a witnessing an Escher world view. Pirating instruments and techniques to decorate and reconstruct environments, out smarting culture vulture by decades. Aeons. Some Graffiti ARTISTS in 2009 are on the cusp of putting some meaning back into HUMAN RIGHTS with HUMAN WRITES. Making sense of a topsy turvey world, faux Image, woided-word and manipulated meaning – hijacked by the greed monsters, Advertising execorpses, Vulture Ministers and Whig Botherhood. Spin doctored. Antidoted by GRAFFABORTISEMENT! CHUSIDEOUT. —Fly Agaric 23. 7th Feb. 2009. 1.50. Amsterdam. Netherlands. Listening to John Coltrane Ballads. “QIUP – Quantum Inseparability Principle, named by Nick Herbert: the impossibility of existentially separating observer and observed. –- Dr. Robert Anton Wilson Quantum Psychology. New Falcon Press. Page. 107. “as if everything were not in displacement, detour, transference, metaphor everything is in the love potion of seduction… —Jean Baudrillard writes in Dust Breeding, 2001. “The matrix is the kind of film about the matrix that the Matrix could have produced — Jean Baudrillard. This entry was posted in Chu, escher, graffabortisement, graffiti, HUMAN WRITES. Bookmark the permalink.